Sleek curves and modern aesthetics make this Chair���a stylistic win for your kitchen or dining space. A great addition to your modern themed interiors, this side chair boasts a long stitch design on the back that adds a hint of elegance to its simple design. The chair features a cantilever style U shaped chrome finished steel base that supports a padded seat and back covered in an easy to clean gray leatherette. 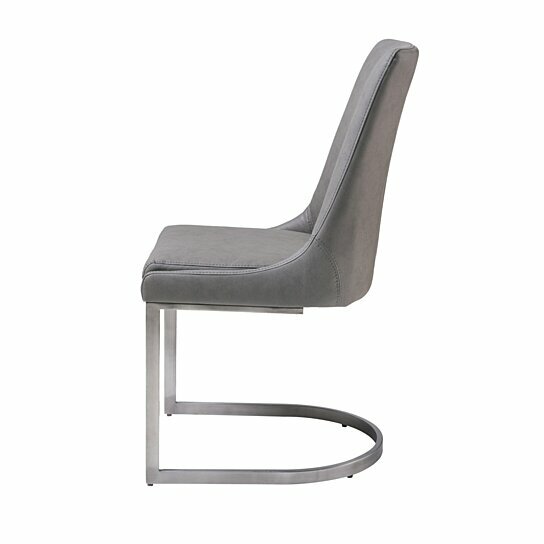 Use this chair in your modern dining room or as accent seating in your office space. Note: Includes one dining side chair only. The chair features cantilever style U-shaped base. Resting upon a metallic base, the seat and the back of the chair is upholstered in durable leather. The chair boasts a long stitch design on the back that adds a hint of elegance to its simple design.